After the foundation of the Congregation of the Brothers CMM in Tilburg in 1844, Bishop Zwijsen received almost immediately invitations to start brother houses and schools in other towns. The bishop waited till the congregations had a few dozen members before he opened a new community in the Belgian town of Maaseik in 1851, barely six years after the opening of the mother house. Many more communities in the Netherlands and Belgium would follow. Zwijsen had learned that he should be careful. The fast and uncontrolled growth of the sisters congregation founded in 1832 had given him many problems. Still, one cannot say that the brothers congregation was acting cautiously, nor that it developed slowly. After the foundation in 1844, both Zwijsen and the brothers took on all types of projects. At that time they spoke of “works of charity” and “works of mercy”. Nowadays we would perhaps rather talk about “social projects” and “development assistance”. It is interesting to see what those very first brothers were actually doing in the Netherlands and in Belgium. 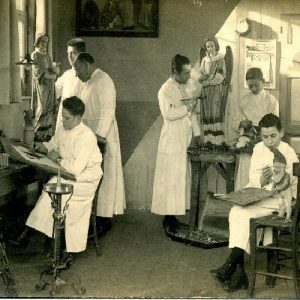 Within the first ten years they started, among other things, a center for orphans and began teaching children in disadvantaged areas; they also started a boarding school, a Roman Catholic commercial school and a seminary, a teacher training college, an institute for blind and deaf children, a few Sunday schools and a number of Catholic leisure activities organizations. Besides all that, they set up, together with the orphans, a printing press, a shoemaking and a tailoring shop. The printing press was mainly intended for school books and religious publications. And, of course, there were a number of household activities to keep all those schools, communities and boarding facilities going. All these initiatives were in a broad sense considered works of mercy. All were launched in the course of the first ten years, and all were intended to improve the living conditions of large groups of people. Thus, clearly the brothers did not hesitate to undertake quite different sorts of work, even though the main emphasis of their mission was indeed on the education and training of youth. Particularly impressive was the speed with which the congregation spread out over the Netherlands and Belgium. After the opening of the mother house in Tilburg (1845), many communities and brother schools followed. Starting from 1885 on, also foundations in overseas territories were established. After World War II there were still houses added in a number of other Dutch and Belgian cities, till – as a consequence of missions in new countries and also due to a crisis in the religious life – a gradual reduction of CMM expansion came about. Taking everything together, it may be said that, after a few generations, the Brothers CMM managed a large Catholic educational network and as well a number of boarding schools with quite specific specialities. The congregation had indeed a great impact on instruction and education in the Netherlands, specifically the Southern part of the Netherlands. For the congregation the aim was never expansion as such; the focus was on education as a work of charity. Some initiatives were specifically geared toward the youth of the upper-class circles, such as the boarding school Ruwenberg, but the brothers always applied the rule that the number of children from poorer families should be at least as large as children from well-to-do families. Furthermore, they were not merely thinking about the possibility of making ‘poor schools’ possible by having ‘rich schools’, but they also aimed at a certain balance between different kinds of apostolate. The work of the brothers did not exclude the wealthy parts of the population, “however, the mass or the greater part of those benefitting from our initiatives should be the poor”, Zwijsen always said. With respect to expansion, the congregation usually responded to invitations that were received. A new foundation was never started if there was no clear support from the local clergy and from friendly Catholic families. The brothers also made use of the connections and the experiences of the slightly older and much faster growing congregation of sisters. Often the brothers started houses and schools at places where the sisters had established themselves already. Finally, an important consideration with respect to expansion was that the brothers, through new foundations, also wanted to promote vocations. Therefore they preferred to go to parts of the country where few other religious were present and where they would have better opportunities to promote new vocations. After half a century the congregation had already more than 500 brothers, living in some twenty communities. After a century, that number had almost doubled. The expansion of the congregation did not take place without complications. In the beginning many initiatives had to be realized without financial support from the government, and they could only exist thanks to gifts received and the ‘free’ labour of the brothers. 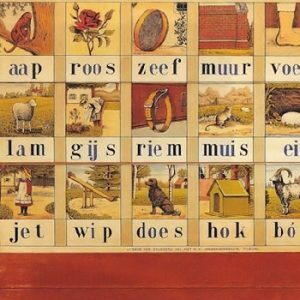 It was only after the Dutch government passed the Education Act in 1920 that the schools of the Brothers CMM were fully recognized and thus would receive the same financing as the public schools. That formed the basis for consolidation of many projects, more extensive professional training for the brothers, and increased specialization in education and care. Besides these financial challenges, the expansion posed the congregation with still other challenges, such as developing skills and leadership, promoting internal unity and mutual communication, as well as adjusting missionary projects to the demands of the time. Again and again the congregation was scrutinising the question: where and how are we at this very moment called to practise mercy?